I’ve read very little travel writing on Australia, but then very little has grabbed my attention. We feel like we know Australia even if we haven’t been there ourselves; from Ramsey Street to the late Steve Irwin and the Australia Zoo we’re familiar with Aussie culture without having to spend twenty-four hours stuck on a plane to experience it. In his book “Ten Pound Pom”, however, Welshman Niall Griffiths turns all that on its head and makes sure that, in no uncertain terms, we learn the truth about what this faraway bastion of equality and opportunity is really like. Back in 1976, Griffiths was, along with his family a “Ten Pound Pom”, emigrating to Brisbane under a scheme sponsored by the Australian government. Griffiths was nine at the time, twelve when the family returned to Liverpool. Here, thirty years on, Griffiths returns to Australia to retrace the journey the family made in a station car from Brisbane to Perth and he alternates the story with a parallel thread that recounts his childhood experience. Part unconventional travelogue, part autobiography “Ten Pound Pom” turned out to be a more worthwhile read than I originally suspected given Griffith’s rants and early and frequent assertions that Australia is ‘shite’. Then there’s a double warning that, while this isn’t a work of fiction, readers shouldn’t take it at face value; his childhood memories are formed from events that took place three decades ago while much of his trip taken as an adult passed by under a cloud of alcohol. Even the cover image discouraged me: I couldn’t figure out exactly what readership the publishers hope to draw in with it but it’s one I’d easily have passed in a bookshop. It’s no small wonder then that I managed to overcome my initial antipathy and discover that among the many expletives, general grumbling and angry tirades, Griffiths does have a few interesting things to say. At times I found the comparisons between then and now quite annoying because Griffiths seems surprised that things have changed; after thirty years, what place hasn’t? 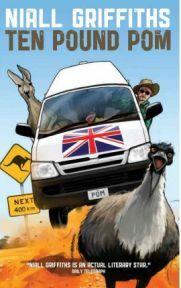 The complete antithesis of television programmes like ‘A Place in the Sun’, “Ten Pound Poms” looks at what Griffiths claims is the real Australian psyche and it’s viewpoint that’s unlikely to see many Aussies rushing out to the bookstores. Griffiths holds that Australians seem to believe in a need to pay for the sins of their ancestors, trusting nobody but resenting the fact that nobody trusts them. The treatment of Australia’s aboriginal people is the source for some rare sensitivity and introspection; Griffiths points out that the tendency among white Australians is to largely ignore the history and culture of the aborigines until they want to exploit it, such as making a money-making attraction of Uluru, or Ayers Rock as they call it. Griffiths’ opinion is essentially that Australian culture is about as deep as your average garden pond and given that Griffiths describes Oz as little more than ‘Blackpool with sun’ you’d be forgiven for wondering why he ever went back. “Ten Pound Pom” is not, though, a travel guide; it’s a book about returning. I loved Griffiths’ idea of being ‘a tourist through my own childhood’. I found his reminisces of that time, written in the third person, curiously detached but that only makes for a stronger contrast between the two narratives and different tones do work rather well together. The curiosity of a child, especially as he discovers the flora and fauna of his new home is really engaging and it’s pleasure to find that, if nothing much else appeals, his enthusiasm for those things has not diminished. Griffiths writes best when calling up these memories: ‘the boy stands in a storm of feathers, a typhoon of noise and thrashing colour, red and green and yellow and blue so bright, eye-rippingly bright’. These fleeting moments aren’t enough, however. For the most part I didn’t connect with Griffiths’ writing style although I’ll concede that I was made to think a great deal and in that respect “Ten Pound Pom” is undeniably engaging. It’s certainly not a book for the faint-hearted; exhilarating in part, but at times an ordeal, I found this a frequently irritating read in spite of the occasional high spots. It’s an interesting idea but the style of the execution really wasn’t for me. With thanks to Riot Communications for providing a review copy. No Comments on "Ten Pound Pom"